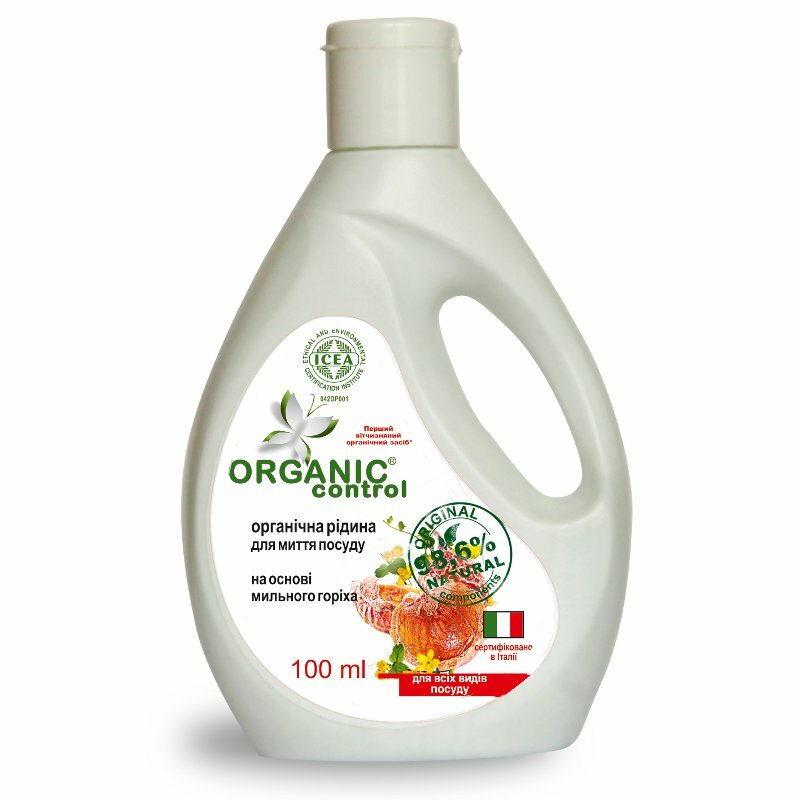 Soapnut Organic Dishwashing Liquid is produced by the Ukrainian brand Organic Control. This safe dish soap effectively removes grease even in cold water. The product contains 98,6% natural origin ingredients. Organic Control dishwashing liquid has a mild detergent formula based on soapnut extract. Soapnut (also known as Chinese soapberry, wahsnut or ritha) is a plant rich in saponins, a class of chemical compounds which have natural foam properties and detergent abilities. They allow to avoid using harmful and dangerous ingredients such as phosphates, borates, formaldehyde, chlorine, EDTA, SLS, SLES. The product is also free of synthetic colourants, fragrances and preservatives. Soapnut Organic Dishwashing Liquid has antibacterial properties. It easily copes with any kind of dirt or grease, makes your dishes shine and does not leave any traces. It is easy to rinse off and biodegradable, thus the product is completely safe for your health and the environment. The liquid does not harm the skin of your hands, it can be used without gloves. Moreover, it even helps to cope with irritation, soothes sensitive skin and makes it softer. Directions. Spray on dirty dishes. Thoroughly rub the dishes with a sponge or brush. Rinse with clean water. Can be used to clean the floor, bathtub and other surfaces. Ingredients. Aqua, Lauryl/Myristyl Glucoside, Sapindus Mukurossi Fruit Extract, Cocamidopropyl Betaine, Benzyl Alcohol, Tetrasodium Glutamate Diacetate, Organic Glycerol, Sorbitan Caprylate, Citric Acid. Want to buy Soapnut Organic Dishwashing Liquid? Call us or submit your order via our web site! Organic Control is a Ukrainian household brand produced by the Pharmaceutical Research Centre “Aliyance Krasoty” (Beauty Alliance). “Aliyance Krasoty” is well-known to Ukrainian consumers thanks to its cosmetic brands such as Bio Pharma Laboratory and Energy of Vitamins. Organic Control is the very first brand of organic household products in Ukraine. Pharmaceutical Research Centre “Aliyance Krasoty” was established in 2007. It’s main aim is to produce beauty and household products which meet the strictest international quality and safety requirements. What started as a small private factory quickly became one of Ukraine’s biggest manufacturers of cosmetics and household products. The company’s production facilities are GMP certified (GMP stands for good manufacturing practices, this certificate ensures that a product is safe for human consumption). Organic Control products are ICEA certified (ICEA is a certificate issued to organic cosmetics and detergents). As a result, all products which comprise the Organic Control series fully comply with the production standards for organic household products developed by Environmental and Ethical Certification Institute (Instituto Certificazione Etica e Ambientale) based in the Italian city of Bologna. This confirms that all ingredients and final formulas of Organic Control products are safe for your health and the environment.